Beautifully decorated, bright and airy flat with everything needed for a relaxing holiday for up to 5 people. The flat has been stylishly renovated to make a cosy retreat from a day's sightseeing in Catalonia. Although perfect for a romantic get away, it's great for families too. A new children's play park is just over the road and a free fast wifi connection and basket ball court will help keep teenagers happy! There are two bedrooms, one double and one twin, with an extra bed available in the twin, to sleep up to 5. The riverside balcony is great for Summer breakfasts, but the apartment also has double glazing & heating for the Winter months. Mature trees shield the flat from full sun, so air conditioning is not necessary, but there are fans if needed. The kitchen is fully equipped for self catering, with several supermarkets nearby. If you want to eat out, take your pick of the enormous number of bars, cafés and restaurants just metres from your door. A washing machine and drying area at the flat takes care of laundry needs. Two short flights of steps or a lift take you to the first floor where the flat is situated so it is fine for those a little unsteady on their legs. There's lots of free parking below the apartment and excellent transport links to the city. In the Summer there is an open air swimming pool, music and bars in Devesa Park opposite to keep all the family entertained. For your peace of mind, the apartment is properly registered under Catalan tourism property laws, but this does mean that passport details will be required. We will absorb the appropriate tourism tax. Your English speaking host is happy to advise on the many activities available in Girona and the surrounding area. However, with the Costa Brava beaches, mountainous Garrotxa region, day trips to France or Barcelona and all the rich culture of Catalonia less than an hour away, your difficulty will be choosing what to do! I moved to Catalonia with my family in 2000 and began to renovate a farmhouse in the hills just behind Girona. Now complete, Can Torras is my rural retreat and a Bed & Breakfast. I then moved on to renovating two apartments in the beautiful nearby city of Girona for self catering stays. I love great food, architecture and art so I am in heaven here and love to pass on my enthusiasm to visitors who are Catalonia. Although I'm a nutritionist and marketing manager in a previous life, here I became involved in house renovation and this is the third of my projects. I love bringing properties back to life and introduce a few quirky additions. The tighter the budget the more fun it seems as I have to scour the local shops and use my imagination. I'm particularly proud of the bathroom in this flat! At my bright, riverside apartments I offer a warm welcome and the assurance that help is at hand should you need it. I have lived in Catalonia for 18 years so please ask as many questions as you like to help plan your perfect holiday in Girona. I also renovated these flats from top to toe so if there are any problems please contact me immediately and I should be able to help. I live just 30 minutes away. The flats are 2 minutes from the old part of town yet with their river view and sunny balcony are a calm retreat from the city. Perfect for families and couples with easy access to the old town. It is a popular apartment for rental by cyclists who can quickly join scenic cycling trails from the city. Catalan cuisine is now the most famous in the world with the number one restaurant, Celler de Can Roca, in Girona. The pride in Catalan food and the ingredients filters down through every family restaurant, so enjoy the local markets and seasonal dishes that this region is famous for. There are food festivals throughout the year, from sea urchins on the Costa Brava in February to freshly pressed olive oils in the Emporda in December. Ask me for my recommendations wherever you are exploring. The French border is only 40 minutes away so you can explore Catalonia, the Pyrenees & a little taste of the Languedoc region as a contrast to Girona. Finally the big city of Barcelona is a must and, with the new TGV train, you can be there in just 35 minutes. Finally, series 6 Game of Thrones was filmed in the streets of Girona, just behind the apartment. Check on line for self led walking tours or contact the tourist board for formal guides with extras of the film. We stayed in this apt for a month in order to explore Girona and try out living in the city, rather than as a tourist experience. For 2 of us there was ample space and the location is super-convenient, a min walk from barri bell and the river/old town. The apt block is populated mostly by working locals, rather than tourist accommodation and the environment reflects this. However, we found the apt very quiet at night, and our major disturbance was the canary downstairs singing in the morning! The amenities are good and the apt is spacious enough for 2-3 people. There is ample parking in front of the bldg, which is a godsend in Girona. The only time we had a problem was during the week of the flower festival when the city was heaving. Karen was an excellent host and provided us with lots of useful info and practical help when we encountered some problems with local administration. In summary, the apt was perfect for our needs and represents excellent value for money for its city centre location. Highly recommended. Thanks so much guys. Glad you enjoyed your stay and good luck with your adventures. We travelled as a family of four and had a pretty enjoyable stay at Karen's apartment. It is not large, but space is sufficient to accommodate two adults and two kids. Apartment is conveniently located close to all attractions Girona has to offer. Finding a parking spot may be tricky, but we used a free public parking across the river and walked. The apartment has "vintage" feel (rustic to some extent), but it has some improvements and the overall feel goes well with a historic ambience of Girona. For the price we paid, it was way better than staying at the hotel. "This two bedroom apartment is very conveniently located to old town Girona and all shopping is within a few minutes walk. Inside it is pleasantly decorated and comfortably equipped. The apartment is part of a large apartment building and unfortunately conversation and noise from adjoining apartments intruded a bit too much for our tastes. Other than this minor complaint, we were very pleased with our stay in this apartment." Thanks for your review Jim. I understand your reservations about noise from neighbours, but this is a residential block with working Catalans rather than holiday party people, so the activity is not inconvenient for most guests. "Nice apartment in a great location. Playpark opposite and a short walk from Old Town with plenty shops and cafes." Logement pour 5 personnes bien équipé,lit confortable.Propre. Proche du centre médiéval et des commerces. Marché 2x/sem pres du logement. La propriétaire est très sympathique,nous a donné des informations pour les visites. Nous avons été visité Barcelone (train de Gerona a Barcelone). Le descriptif sur l annonce correspond au logement. Parking non payant pres du logement. Many thanks, so glad you enjoyed you stay. Girona has so much more to offer in the summer months in recent years. Merci beaucoup, si heureux que vous avez apprécié votre séjour. Girona a tellement plus à offrir dans les mois d'été au cours des dernières années. 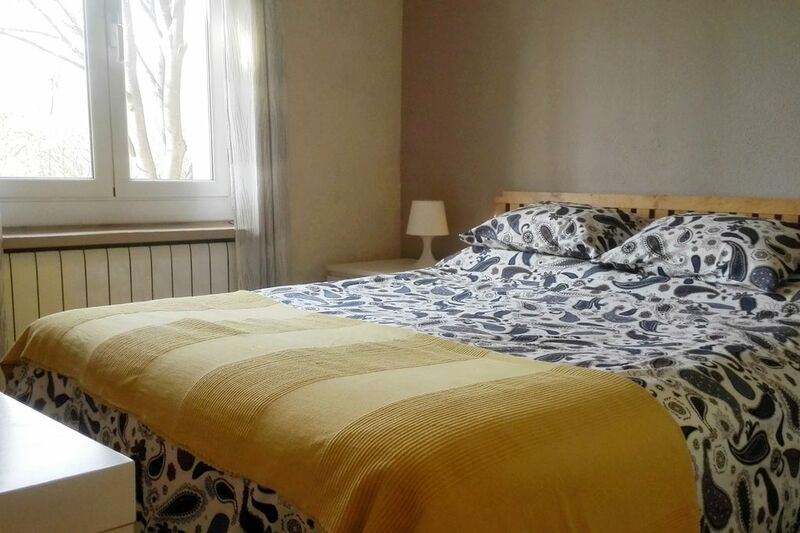 "APPARTEMENT TRES BIEN SITUE A L ENTREE DU VIEUX GERONE, PAS DE PROBLEME POUR SE GARER TRES PRES EGALEMENT DU PARC DE LA DEVEZA ET DE SON SYMPATHIQUE MARCHE, APPARTEMENT TRES PROPRE ET BIEN DECORE, DOCUMENTS TOURISTIQUES SUR PLACE BIEN APPRECIABLES." Just 5 minutes from the flat is a walkway on top of the old walls of Girona giving magnificent views of the city and to the hills and mountains beyond. Alternatively you can choose an easy walk into the valley of St Daniel and the countryside of the Gavarres hills, eventually Els Angels Sanctuary where Dali was married. Girona is famous for cyclists and 6 professional teams are based here year round. There are several bike hire shops for road and mountain bikes and each can recommend trails. Golfers will enjoy PGA Catalunya voted best golfing resort in Europe in 2013 just 30 mins away with Pals an alternative. There is also a Pitch and Putt to the South of Girona. There is a huge amount of water sporting activities 30 minutes away on the Costa Brava at S'Agaro or you can choose a section of the coastal path which runs down from France. This historic area offers freshwater lakes, the volcanic hills of Garrotxa and the Pyrenees and many charming medieval villages within one hour of the apartment. Great cafés and restaurants a short walk away for more leisurely pursuits.